EMS/Firefighter professionals are first on scene for thousands of mental health and suicide attempt medical crisis every day. With input from members of the Colorado EMS Association, and with the help of the Redlands, California Fire Department and 1st responder organizations, this certificate course addresses the knowledge and skills first responders need to deal effectively with suicidal people, family members of the deceased by suicide, and to look after the health and safety of their colleagues and co-workers. 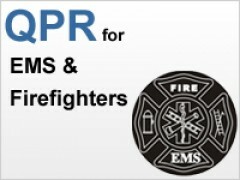 EMS/Firefigthers have a high degree of line-of-duty exposure to suicidal behaviors, both in the pre-attempt phase (when suicidal persons are communicating intent and desire to attempt suicide via suicide warning signs), and after a suicide attempt or completion. Reduce morbidity and mortality of suicidal persons served by health care, correctional, hospital and other institutions through a systems approach to suicide risk reduction that enhances first responder and clinical competencies to detect, assess, monitor, manage and treat persons known to be at elevated risk for suicidal behaviors. Based on department staff patterns from the U.S. Fire Department Profile 3013 Fact Sheet, leadership can create a "circle of safety" by providing unlimited training with 24/7 access to career staff, volunteers, and POD volunteers. All volunteer departments: $5 per staff person per year. To access training under a subscription license, a unique access code is issued to your department which you may distribute as you see fit. Large departments please call for pricing.